The weekend of British Pie Week gave even more time fore pie eating. 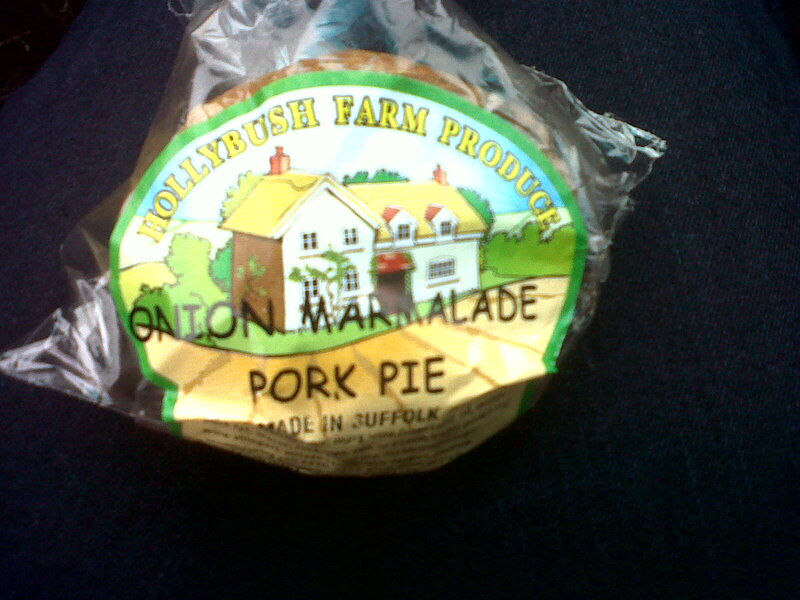 Upon taking a trip to a Co-op in Ipswich SJL was pleased to find they stocked pies made by a local Suffolk pie company called Hollybush Farm. There was a great selection of pies to choose from but SJL decided that the one that would be best to eat cold was the Onion Marmalade Pork Pie. A bit of a twist on the classic pork pie this pie was a delight to eat. The pastry was crumbly and soft. The filling was not at all chewy or fatty and the onion marmalade gave it a lovely sweet edge. This was one of the best pork pies SJL had tasted and at 99p it was quite good value for a sizeable pie. With just two days of British Pie Week remaining, there was no time for Pierateer RAS to start resting on his laurels! 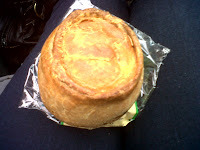 However following a nice lie in, there was no need to have a breakfast pie on day six, as RAS went straight into lunch. Of course, the lunchtime menu contained pie. A Tesco Chicken and Bacon Lattice Pie, to be precise. But as much as he would have liked to eat the family sized pie all himself, RAS used this pie eating time as an opportunity to spread the love of pie with his new Italian housemate, Vincenzo. While Vincenzo had eaten a pork pie already in his first month of living in the UK, now that he had just moved in to live with a professional pie eater this was his first op-pie-tunity to try out a full meat and sauce/gravy pie. 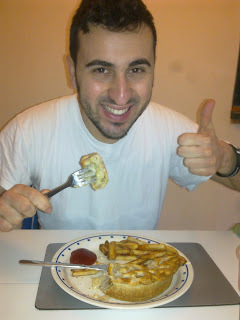 Vincenzo wasn’t to be disappointed! The Tesco Chicken and Bacon Lattice Pie was very good (full review coming soon) and Vincenzo described his first proper pie experience as being “Deliziosa!” Here’s to many more delightful pies in the weeks and months to come! Pierateer RAS then caught up with two university friends (Stu and Helen), to hang out and chat pie, and then met another old university friend at the end of his sponsored 100 mile bike ride. Well done Dan! To celebrate this amazing achievement, Pierateer RAS had his own celebration with a Steak and Kidney Pukka Pie and chips! This was RAS’s 5th Pukka Pie of the year, as part of the Pierateers joint attempt to eat 50 Pukka Pies in 2013 to celebrate 50 years of Pukka Pies!